Designers and manufacturers used their furniture shown at International Exhibitions to illustrate their skills in design. Such pieces combined exotic materials, such as mother-of-pearl and ivory, and excellent construction. This cabinet is typical of such exhibition furniture. Bruce J. Talbert (1838-1881) was a successful commercial designer of metalwork, stained glass, wallpapers, textiles and furniture. He also published two books of designs for furniture, one of Gothic ideas in 1867, and another of Jacobean designs in 1867. 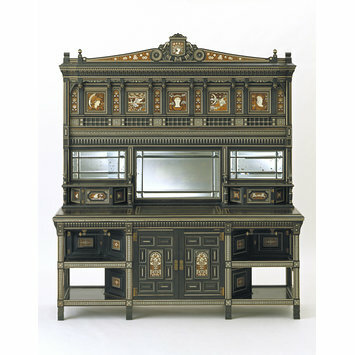 The firm of Jackson & Graham, which made this cabinet, was established by Thomas Jackson and Peter Graham at 37 Oxford Street, London, in 1836. They expanded rapidly and their premises included both workshops and retail showrooms. The firm specialised in high quality furniture, using luxurious materials as seen in this cabinet. The International Exhibition held in Paris in 1878 offered Jackson & Graham the opportunity to display their finest products to a continental audience. and the firm won the Grand Prix d'Honneur for the British Section of the exhibition. The cabinet was bought by the Khedive of Egypt (the viceroy of Egypt during Turkish rule from 1867 to 1914) for £2,000. Cabinet veneered in ebony with marquetry panels employing exotic woods, ivory and mother of pearl. 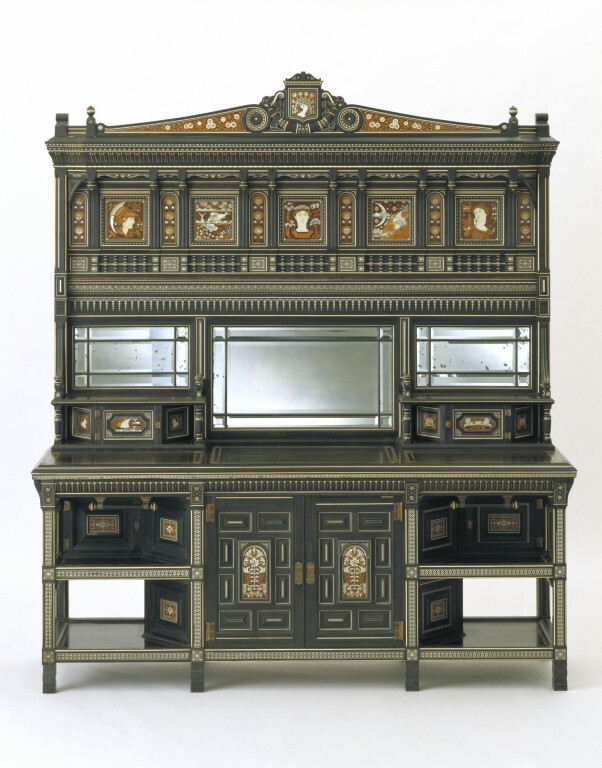 This cabinet was shown by Jackson and Graham as the "Juno Cabinet" at the Paris International Exhibition of 1878, where it won the Grand Prix d'Honneur for the British Section and was purchased by the Khedive of Egypt (the viceroy of Egypt during Turkish rule from 1867 to 1914) for £2,000. The Khedive apparently commissioned a room en suite at a cost of £6,000, according to Talbert's obituary in a trade periodical, The Cabinet Maker, which also described the Juno cabinet as "showing the versatility of Talbert's genius, and his power to grasp Classicism with the same success as Gothic and Old English", The Cabinet Maker & Art Furnisher, vol. II, no.13, 1 July 1881, p.5. Historical significance: The design for the Juno cabinet may have evolved from an earlier ebony and ivory cabinet illustrated in Talbert's second book, Examples of Ancient and Modern Furniture, Metal Work, Tapestries, Decorations &c.(London, 1876). This earlier cabinet was designed to match some Indo-portuguese chairs illustrated in Shaw's Ancient Furniture (London, 1836). Cabinet veneered in ebony with panels depicting the themes of the Judgement of Paris and the Trojan War in marquetry of exotic woods, ivory and mother of pearl. Designed by B.J. Talbert and made by Jackson and Graham. English, 1878. Jervis, Simon. Charles, Bevan and Talbert. In: Susan M. Wright, ed. The Decorative Arts of the Victorian Period. London: Society of Antiquaries, 1989. MacDonald, Sally. Gothic Forms Applied to Furniture: the early work of Bruce James Talbert. Furniture History. 1987. Vol. xxiii, pp.39-60. Talbert, Bruce James. Examples of Ancient and Modern Furniture, Metalwork, Tapestries, Decorations &c. London, 1876.